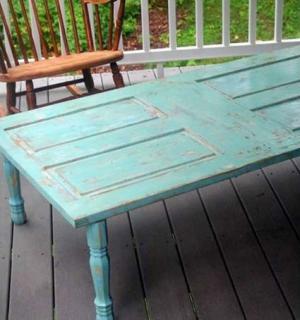 There are many items that you can upcycle to repurpose as a coffee table. Most conversions don't require much skill or time. What you end up with is a conversation piece and a good feeling that you've done a small part to reduce much of the waste that obsolete objects create. Before you start any of these projects, you'll need to know the height of your coffee table and have a variety of tools on hand -- in addition to the specific project materials -- so you can easily complete your coffee table. When working with any of these projects, keep in mind the height of the table you desire. As a rule of thumb, you want the coffee table to either level or one to two inches lower than the sofa seats. The industry standard for coffee table heights are 16 to 18 inches. If your sofa seat is higher, then you need to adjust the height of our coffee table accordingly. The easiest way to do this is to measure the distance from the floor to the top of your sofa cushion. Each project has a list of materials required. You will need to determine which additional tools are best, such as pencil, measuring tape, scissors, screw driver, saw, gloves, and so on. Be sure that you have all the tools you need before starting the project. If you don't have a reciprocating saw or circular saw and you need to a piece of wood cut for the table, consider having this done at a local cabinet shop. Just take accurate measurements to ensure a perfect fit! 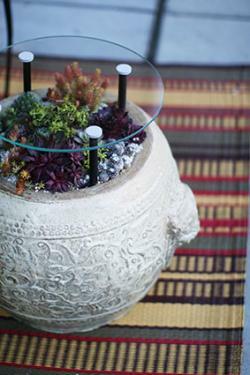 Repurpose a large flower pot or planter for a unique coffee table. You can either leave the planter as is or paint it. Consider using a favorite stencil in colors that are best suited for your living room color palette if you choose to paint it. This table will become a living piece of furniture that's both functional and aesthetically pleasing. This style will fit almost any décor and is especially attractive in a country cottage interior. A smaller pot is perfect for someone with a small apartment or living room. Average cost is $20 - $75. Measure the height of the pot and determine how much additional height you need to reach the average coffee table height. This last measurement is the distance needed for the exposed pipes, but you should add at least eight inches or more to this figure since the pipes need to be set deeply into the rocks and potting soil you will use to fill the pot. Set the pot saucer or tray onto the floor and place pot in it. Hint: If you're concerned about moisture, create a barrier between the saucer and the floor with a sheet of plastic cut to size. Fill the pot with a layer of gravel followed by a layer of soil until it is 3/4 full. Insert three or four copper pipes into the pot, adjusting so they will evenly support the glass table top. Cover each end of the exposed copper pipe with a rubber cap. Measure the total height, including the pipes and adjust as needed. Plant succulents and/or other houseplants and water according to plant needs. Add the smooth stones last so they are exposed on the top of the pots and fill in between the plants. Set the glass table top onto the copper supports and make sure it's even and secure. The rubber end caps will prevent the glass top from slipping, although if you have active kids or pets around, you may want to use strong glue, as well as end caps, as an extra security measure. Enjoy your lush garden coffee table. 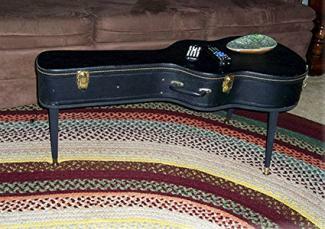 Make a unique coffee table with storage by using an old guitar case. You can paint, stain, or simply leave the case in its natural condition. This is a great conversation piece for an eclectic or casual living room, especially if you or someone in your household is a musician. Average cost is $25 - $45. Place guitar case onto plywood and trace shape with a pencil. Remove case. Use a reciprocating saw or other saw to cut out the traced guitar case shape. Paint or stain one side of the cut guitar shape. Paint or stain furniture legs and once dry, attach two legs to painted side of plywood at the bow and one along the narrow neck end. On level surface, preferably the floor, turn guitar case upside down and run a bead of glue (Liquid Nails) along the bottom side of the case to form an outline. Run another bead of glue through the center length of the case. Hold plywood cut out by legs, turn upside down (unpainted side) and line up with the glue-lined side of guitar case. Set the unpainted side of plywood cut out (legs will be up in air) on top of glue side of guitar case, keeping the plywood and case aligned. Allow glue to dry according to manufacturer's directions before righting table for use. Wood pallets are often discarded and are easy to salvage. For this project, you need two pallets the same size. Most pallet sizes will give you a square table. If you wish a narrow table, then you'll need to cut the table in half as demonstrated in the video. Furniture and appliance companies and big box companies receive merchandise on pallets they often discard in dumpsters - just ask before you take any. You can find ads on various sale and swap websites and local ads for free wooden pallets. This type of table is a great look for an industrial styled loft, rustic living room décor, or a design dedicated to repurposing and upcycling. Average cost is $25 - $45. You need to clean the pallets using a stiff scrubbing brush, warm water, and soap. Use a degreasing soap since there could be chemicals and oils on the pallet. Allow wood to dry in sun before using. Make sure the wood has thoroughly dried out. Attach the two pallets together by applying Liquid Nails on the slats of the bottom pallet and place the second pallet on top. Allow glue to set up. Further secure the pallets by installing a set of hinges on ends opposite each other. Use the screws that came with the hinge sets and install eight inches from the outer edges. Mark measurements with a pencil and attach a set of hinges on opposite ends of the pallet table. Each hinge will be attached to the top and bottom pallet. One half of the hinge is installed on the lower portion of the top pallet and the other half is installed on the upper portion of the bottom pallet. Use either manual or electric sander to smooth out the surface of the top pallet. Paint or stain the pallets to your desired look. This can be done with one or several stains or paint colors. Varnish if desired. Once paint or stain is dry, invert pallets to install caster wheels according to manufacturer's instructions. 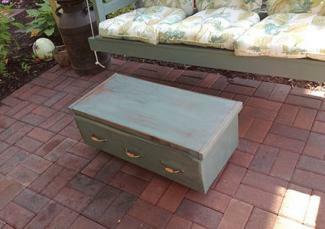 A deep long drawer from a chest of drawers can be used for a coffee table. This type of table also affords you a nice storage space. This a very quick project since it doesn't require a lot of time. You can either add a top to this table or you can use it open-faced to display a cherished collection, books, magazines and other items. This style of coffee table is great for a Craftsman style, modern, rustic, country, cottage, or chic décor. Average cost is $35 - $45. Before you start, remove any drawer pulls or knobs. Sand the drawer with a medium grade sand paper to scuff up the finish so the paint will adhere. Brush off the dust residue before applying paint. Either brush or spray paint the drawer to desired finish. If using wood knobs, paint and allow to dry before reattaching. If reusing drawer pulls, reattach once drawer paint is dry. Paint furniture legs, allow to dry, and then attach to bottom of drawer with Liquid Nails. Measure and cut plywood top so that it will sit flush against the open drawer. Hint: Turn drawer upside down onto plywood and trace with pencil. Sand and paint plywood top. Once it's dry, attach it to the drawer with hinges. This project is created by using an old door. This can either be a panel or solid door. 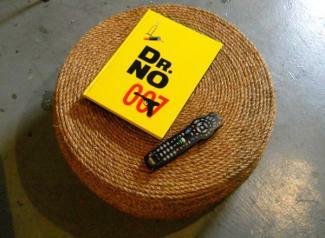 If you aren't sure how long you wish your coffee table to be, the average rule of thumb is 2/3 the length of the sofa. That doesn't mean you can't have a longer or shorter table, however. Door sizes will vary. The standard door height is either 80" (6'8") or 78" (6' 6"). Average door widths can vary beginning at 36" (3'), 32" (2'8") or 30" (2'6"). This table style is ideal for a country, cottage, rustic, primitive, or modern chic home interior. Average cost is $10 - $15. Measure how long you wish the table to be and then cut it with a saw (circular or table saw). Sand door to scuff up existing finish so paint or stain will adhere. Paint or stain door and furniture legs. Once door and legs are dry, attach legs per manufacturer's instructions. This project is very simple to create. A surfboard can be used to complete your dream living room. Immortalize your favorite board and only add legs to it, or paint it to your own art. 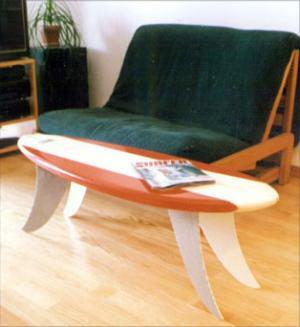 This coffee table design is an obvious choice for any surfing enthusiast or beach home. Average cost is $10 - $20. Sand the surfboard to remove residue and scuff up finish so paint will adhere. Paint board and furniture legs or pedestal. Glue board to pedestal using Liquid Nails or attach furniture legs according to manufacturer's instructions. You can create a unique coffee table by using an old tire. All you do is cover the tire with sisal rope and add furniture legs to the bottom for a finished upscale look. Find old tires at junk yards, tire companies, full service gas stations, or simply save the ones from your car when you buy new tires. Sisal rope can be purchased at most hardware stores. If you don't own a saw, have a local cabinet shop cut the plywood rounds for you. This style of coffee table is great for a beach, chic, Bohemian, or casual style décor. Average cost is $70 - $90, although the cost can vary depending on style of furniture legs used. The first thing you need to do is clean the tire thoroughly before bringing it inside. This requires a grease cutting detergent and a stiff brush. Be sure to scrub the inside of the tire wall. Place the tire in the sun and allow it to dry completely. Cut two rounds of plywood. One round should be the circumference of the tire and will serve as the base. The other should be smaller in circumference, enough to overlap the opening to provide support. Place the top round onto the tire and drill six to eight holes for screws at the edges. These should be significantly smaller than the screws. Install screws to secure the top round to the tire. Use the Gorilla glue or other strong glue to secure one end of the sisal rope in the center of the round. Allow to dry. Using the caulking gun, apply Liquid Nails to a small length of rope and begin wrapping in a coil to spiral out from the center. Add glue as needed. Continue until the plywood round is completely filled. Cut sisal rope and glue end securely. Hint: Some people prefer to use a paint brush to work the glue onto the entire plywood round and then spiral wrap. Using the same method of gluing, wrap the rest of the tire with the sisal rope, starting at the top and working to the bottom. While the glue is drying, attach the furniture legs to the larger piece of plywood. Depending on the style of legs, you will need to drill holes and attach the legs with the screws or bolts that came with the furniture legs. You can also apply Liquid Nail if desired. Paint or stain base and furniture legs. Once the stain is dry, attach the base to the tire, the same way you did the top round by drilling holes and then installing screws. Apply a protective coating of polyurethane or similar finish to the sisal to prevent shedding. Allow to dry before using. If you want a larger surface space, then place a glass table top onto the finished table. Be sure the glass is heavy enough that it won't slip or secure to the sisal top with six evenly spaced drops of Liquid Nails. These ideas are simple and fast ways to reclaim old furniture and other items to create a unique coffee table. It doesn't take a lot of time or skill to make something useful out of an object or furniture by giving it a second life.